• ATTRACTIVE – Extruded aluminum side rails, and flush-mount leg assemblies provide a clean appearance without obstructing your view of the lake. • LIGHTWEIGHT – Welded aluminum frames with removable decking panels simplify installation and removal. • EXPANDABLE – With the built in “quick connect” system, sections simply clip together, with no bolts required. Optional side connectors and end caps allow for future additions and multiple configurations. 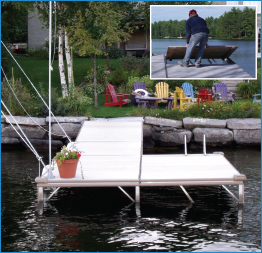 • BOAT FRIENDLY – Slide in PVC bumper system protects your investment and provides a clean finished appearance. Bumper available in beige, grey, white and black. 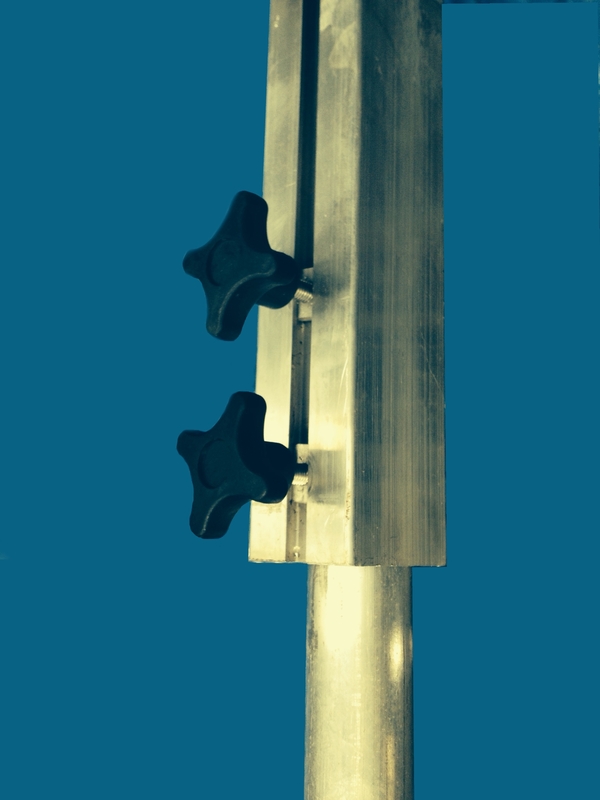 • ADJUSTABLE – Flushmount adjustable leg assembly keeps posts below deck, for a cleaner look. 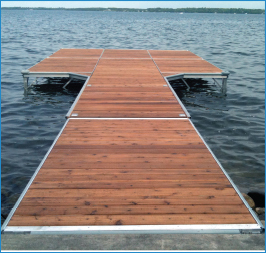 • STABLE – With built-in bracing, and additional bracing for longer legs, docks are strong and stable. 8’, 10’, or 12’ long welded aluminum frame. Sections can be 4’ wide, 5’ wide or 6’ wide. Can be purchased with no decking, or your choice of available decking options. Decking comes in easy to remove panels. • One welded aluminum frame. • Two slide-in PVC bumper strips (extra bumper available). 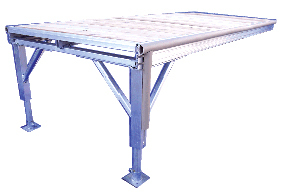 • Two Single leg assemblies with leg bumpers, galvanized pipe and base plates. • Removable deck panels (except “No Deck” sections). • Standard PVC colours are Grey and “Olive Wood”. For premium colours of PVC, contact HMS for pricing. 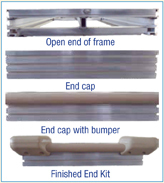 End cap with bumper – Finishes open ends of frames where bumper is required. Deck clamps – w/ screws $12.50 each. SS Lock Bars – w/ set screws $15.00 each. Rough Water Kit – For rough water applications, Includes stainless lock bars, deck clamps & hardware. Cedar: 8’ or 10’ $90.00 * 12’ $115.00 / section. ThruFlo: 8’ $90.00 * 10’ or 12’ $115.00 / section. PVC: 8’ $115.00 * 10’ or 12’ $140.00 / section. Extra Bumper Double / bottom bumper for added protection. Side Connectors – For connecting sections side by side or side to end. Connector plate – For attaching HMS section to existing dock/deck. Incl. fasteners. For attaching sections together when one section is on a grade. .Includes fasteners and end caps and/or alum. plate. Reinforced End For attaching to floating ramp. 4’ $150.00 * 5’ $160.00 * 6’ $170.00.